Be the first to share your favorite memory, photo or story of Kecia. This memorial page is dedicated for family, friends and future generations to celebrate the life of their loved one. 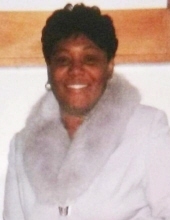 Kecia A. Peay was born on October 3, 1967 to Ms. Mary A. Peay and Mr. John Lawrence in Newark, NJ. She received Christ early on in life, attending Christ Temple every Sunday. Kecia also attended Newark Public Schools where she received her GED. Kecia had an impeccable resume. It includes S.C.S. Business School and Berkley College. She worked for Prudential Insurance Company in the claims department for years. She then decided to take up a career as a Dialysis Technician in 2000. Kecia is survived by: one sister, Michelle Peay; two brothers, Keith Peay (La'Kesha) and Jarrod Peay; along with four nieces, six nephews, and a host of other family and friends. She was preceded in death by her parents, Mary Peay and John Lawrence. This Online Memorial has been created to commemorate the life of Kecia A. Peay. Leave a message on the Tribute Wall to share your favorite memories and offer words of sympathy and comfort. To send flowers or a remembrance gift to the family of Kecia A. Peay, please visit our Tribute Store. "Email Address" would like to share the life celebration of Kecia A. Peay. Click on the "link" to go to share a favorite memory or leave a condolence message for the family.